It was Hollywood Studios. It was Star Wars Weekend. It was going to be the most crowded day we were going to experience. And the most Awesome! So we wanted to make sure we got a good early start. We got one. We set the alarm for 6:30, so we could get everybody up, fed, and moving to get to the park at 8. We wanted to be there as close to opening as we could get. A. I'd heard the Stormtroopers do something. B. 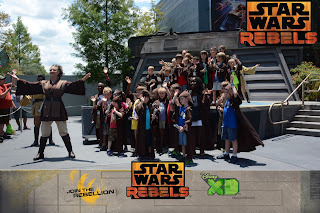 We wanted to get the big boys to sign up for Jedi Padawan training. That meant running to the back with them to sign up as soon as the place opened. Indeed, many others had the same idea. But about half way down the street, a pair of Storm troopers debated about the necessity of 'guarding the street. They finally dropped their high tech system, a rope, and let us through. They were funny. They showed up later too. Boba Fett guarded Han Solo up on the stage. It was weird no longer having the Ears and Hat at Hollywood Studios, but it was neat and bright to have the stage, and have stuff going on throughout the day. As the big boys had to wait through an hour line for Padawan training, Jacob and I went to the bathroom, padded about a bit, and explored. Then we noticed people were sitting down already at 9 am for the 11 am parade. So we grabbed a cushy curb in the shade and staked out some seats. While I staked out the seats, Eric got them signed up at 12:30 for Padawan Training. Well, so much for our Toy Story Mania Fastpasses. But so what, we just decided to DAS it later. 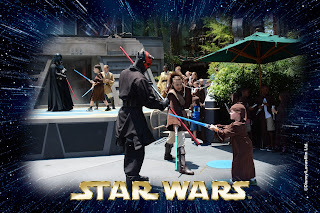 We had Chris do some Prioritizing, and he told us he wanted to do Star Wars Padawan training, and then Star Tours, which they had passes for from 9:30-10:30, then Toy Story Mania. Well, Mommy thought they would enjoy the parade. So I got us some seats. 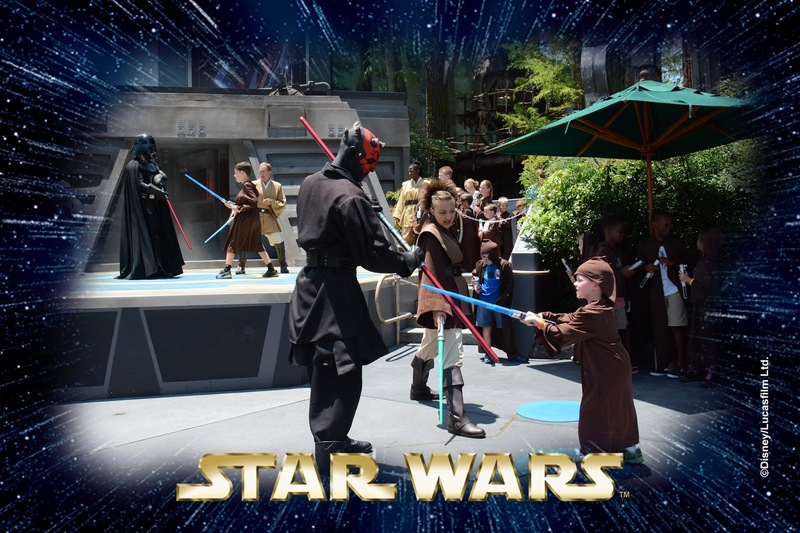 After signing up, Eric took the big boys on Star Tours. After they did Star Tours, I needed sustinance. So we took advantage of one of the new additions to us, to WDW. Starbucks. Why Yes, that is an iced white mocha as big as my head, that I'm sipping in the shade, Thank You Very Much. God Bless Eric for tackling the line for me for that one. Sam wasn't a fan. So when they came back to guard our seats, and let me take my turn, I got to ride it with just Chris. It was very special. He was acting like the old pro, telling me what had happened while he had ridden with Daddy and Sam, pointing out where they'd stood. He really enjoyed the ride. This little beasty was my cohort in crime, steaking out our shady seats. I made friends with a gal next to me, who used to be a CM, who lives locally and sees the parade every year. She was really nice. I didn't feel like the crazy one. No one thought I was odd for quoting Star Wars all day, or seeing certain things. All these Disney and Star Wars obsessed people - they are my kind of people. There's an understanding amongst us, instantly, we get it. And that was really cool to experience. Sam demanded a snack, and we were right across the street from a popcorn/ice cream stand. So we had to get a Mickey Ice Cream bar. Yum. My other partner in parade waiting crime. By the time the parade was ready to start, we were READY! 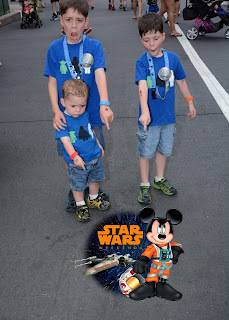 One of the things we did while we waited was put on some Star Wars temporary tattoos. I had grabbed a hotel washcloth, wet it, and put it in a ziplock bag. That was something I'd seen someone do the day before, pull out a washcloth to rinse himself of sweat. I thought it might be handy for that AND parade waiting tattoos. We even had enough tattoos that we were able to share with some of the kids around us. It was an honor to share, and bring a little Pixie Dust to those around us. The Grand Marshall of the Parade - Jedi Mickey! These were the only two I could capture that marched together. The rest didn't. It made me a little crazy. Sand People march in single file to hide their numbers. And what else was awesome, not only did Eric and I catch that, but so did a couple other ubergeeks around us. See?! It's good to not be alone in our geekdom. A Sand person took a little interest in Christopher. That other guy bringing up the rear of the parade. Looking good, and breathing low, he was pretty awesome. Afterwards, we ran to the ABC Comissary for a quick lunch. Then it was time for Padawan Training. These are some of the Photopass Guy's photos from Padawan Training. 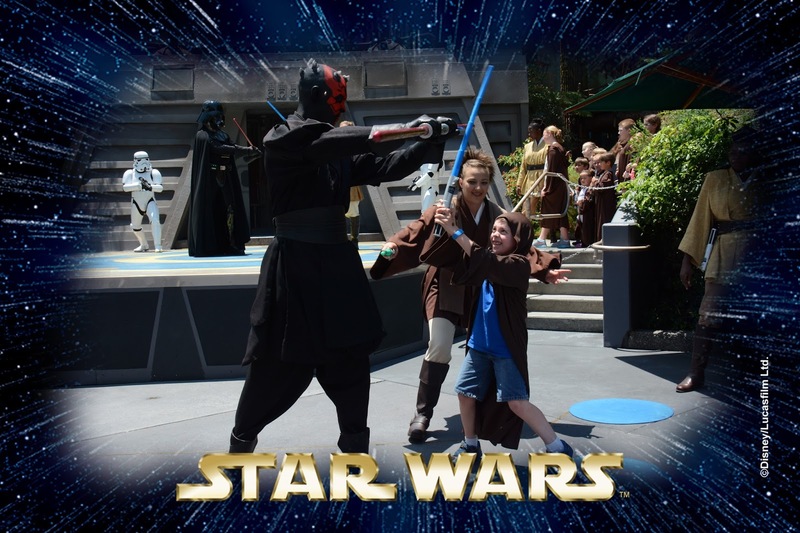 Suddenly, the boys had to fight Darth Maul! So of course, I had to spike them with fancy frames. It was Hot! And these Younglings showed up like true Jedi, fighting when it got tough. 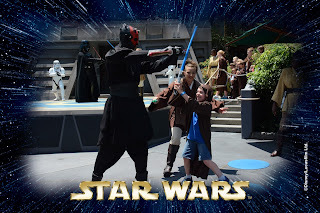 After Padawan Training, we took Jacob to the Star Tours store, where he got to pick out his very own Light Saber! He chose Purple, and we chose a handle that looked completely different from his brothers' sabers. Chris was mad I didn't let them bring their light sabers to the park. When finished, Jacob's light saber was bigger than he was! We headed back to the hotel for naps. But we weren't done with Hollywood Studios yet, we still had Part 2, the evening to go! These boys were Ready for the Evening Festivities! However, just after we got on the bus to go back, it started to rain. Hard. Luckily, I had packed dollar ponchos for everyone. I also had packed a shower curtain and clips to keep Jacob dry on his stroller. We had tried to make it to Disney Junior before the last show of the day. And we would have.. except it became a Storm Shelter, because no one would leave to go out in the pounding rain. No one but us. We had dashed through the park to get to our destination, getting SOAKED. So then we just stood there, chatting with the CMs, who were super nice. The didn't know for a while if they were going to do the show or not. So we just waited out the rain with them. Super nice. When all was said and done, and we couldn't do the show, they gave us fastpass cards, so that we could walk on to that or any other major ride another time. When we realized we had no deadline, we thought, we'll try to come back Tuesday or Wednesday and see if we could still do the Disney Junior for Jacob. So then we passed by Star Wars again, on the way to dinner, we had checked in to use the DAS pass on the Toy Story Mania ride. But we stopped for a Speeder bike photo. The funny thing was, we couldn't get anywhere near this place for our photo earlier, because Chewbacca was here, but in the drizzly rain, all the characters were gone. So we got a pic with our kids in their ponchos instead. Eric and I thought that extremely appropriate, since originally Luke and Leia wore poncho things when they rode the speeder bikes too. Ha Ha! Our dinner was at Hollywood and Vine with Jedi Mickey and all his friends. Can you tell how soaking wet we were? I even took my shoes and socks off so I could try and air out my shoes. Dale came around, dressed as an Ewok! 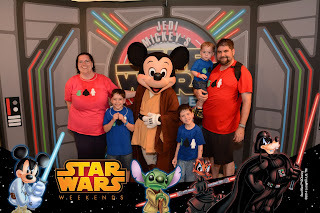 Leia Minnie came around and got her pic with the boys. Stormtrooper Donald was a big hit with Jacob. He called him Quack Quack. The Dessert buffet was Awesome. 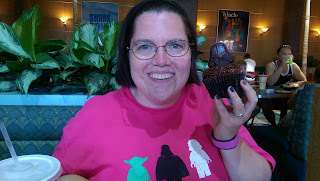 Yes, that's a Jabba the Hutt cupcake. It was pistachio cake with carmel cream. And Jacob stole my Chewy Cookie. Eric found the blue milk ice cream. But the best character visit was Darth Goofy. He had the boys cracking up. At one point, he hid them under his cape. We were all in stitches. He was our last visitor, and the Best. After dinner, we popped over to Toy Story Mania, and the kids got a huge kick out of it. It was the first semi-dark ride that Jacob didn't freak out on. After that, it was time to head to our Grand Finale. With our dinner, we got preferred seats for Fantasmic! It's a Mickey Mouse water and fireworks show. I don't think Eric and I had ever seen it. I think it was maybe 1991, the first trip I ever took with my Mom and Auntie Yo that I'd seen it. I barely remembered it. But it was AWESOME! I loved the light, the water, and the throwback to some really great old classic Disney movies. There was Maleficent, and Fantasia, two of my favorites. There was a fire, and that scared Chris for a moment. I was glad I'd packed their headphones. But then Good Triumphed, and he was all, THAT'S AWESOME! With that, the show was over, and we needed to make a run for it. As we walked out of Fantasmic, the Star Wars Symphony Fireworks started. I loved this when Steamboat Willie brought all the characters (well maybe not all, but a lot of them) out on his boat. So Cool. With that, the show was over. And we needed to head out. But as we were leaving Fantasmic! the Star Wars Symphony Fireworks show began. The big camera had been packed, to protect it from the rain, it was starting to drizzle again. We never did really dry out. But I had the point and shoot, so video worked better. It was Beautiful to hear that John Williams playing, and the Fireworks were Very Cool. We didn't want to stop, there were a ton of people, and they'd all be leaving we were desperate to catch the bus. We got out by 3 minutes. We were at the gate when the fireworks began, and people immediately flooded out. But we got on the bus. It pulled up right as we got there. And we literally got the last one out before the crowd wave hit. The kids were Exhausted, we were wet, sore, felt gross, but it was Great! What a Wonderful Day!